System of a Down -- Question! Now, what do you own, the world? how do you own disorder... disorder? Leonardo DiCaprio produced 11th Hour to demonstrate the ways our (American) lifestyles are straining on the environment. 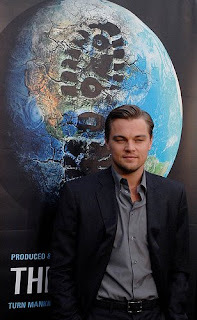 The first half of DiCaprio's documentary makes two basic points: (1) The Oil industry is evil, and (2) we are all going to die if we don't stop destroying the earth's ecosystems. These points seem reasonable. DiCaprio saved the really good stuff for the documentary's second half and special features. About halfway through 11th Hour transitions from the usual environmental shpeel to offering a surprising lot of insight. In particular, Leo's interviewees dare to trace our environmental woes back to individual, personal issues (which, of course shape the direction of society as a whole). 11th Hour dares to questions our consumptive way of life -- the way of the consumer -- where consuming is an end in itself. As an American, I have been trained by mainstream media to believe that Consumerism = Freedom. Corporate advertising has conditioned us to measure freedom according to how much we can either accumulate or consume. "I have the freedom to pursue happiness, which means I can buy a lot of stuff." This works out well for major corporations, but not so much for the environment. However 11th Hour points out the fact that consumerism does not equal freedom (gasp). Our personal fulfillment does not depend on our ability to consume. If I accumulate a lot of things, this does not make me wealthy. "Expansion" is not synonymous with "progress." Bigger is not always better. 11th Hour very astutely points out that we work for the sake of maintaining our lifestyles while most of us don't like working so much and, much of the time, we don't like the lifestyles we're working for. An environment left in shambles is the aftermath of our misplaced priorities. We think too much about "well-having" while we should be thinking more about "well-being" (as an interviewee in the movie said).
" Do not worry about your life, what you will eat or drink; or about your body, what you will wear. Is not life more important than food, and the body more important than clothes? Look at the birds of the air; they do not sow or reap or store away in barns, and yet your heavenly Father feeds them. Are you not much more valuable than they? Who of you by worrying can add a single hour to his life? And why do you worry about clothes? See how the lilies of the field grow. They do not labor or spin. Yet I tell you that not even Solomon in all his splendor was dressed like one of these. If that is how God clothes the grass of the field, which is here today and tomorrow is thrown into the fire, will he not much more clothe you, O you of little faith? So do not worry, saying, 'What shall we eat?' or 'What shall we drink?' or 'What shall we wear?' For the pagans run after all these things, and your heavenly Father knows that you need them. But seek first his kingdom and his righteousness, and all these things will be given to you as well. For where your treasure is, there your heart will be also. " "Our personal fulfillment does not depend on our ability to consume." You've quoted perhaps the most industriously ignored passage in the Bible. Perhaps my interpretation of this passage is different than most, but I have never seen, nor heard of, a group of Christians who seriously adhere to this admonition. Have you?